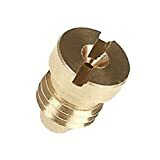 Upgraded Foam Nozzle: Heavy duty brass core is much thicker and heavier, nozzle and plastic connector are tighter, don't shake easily for durable use. Bigger foam core make foam is more dense and thick. Filter Block: With filter on the end of tube, filter particles in the soap or water, never scratch car paint. MATCC pay attention to every detail to provide best care for your car. 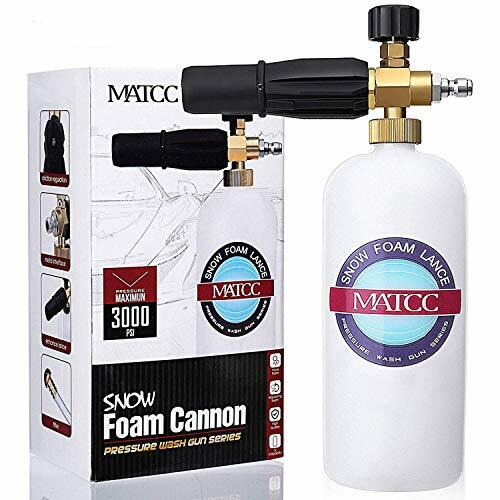 Quick Connect Nozzle: Adjustable Snow Foam Lance with 1/4" quick disconnection fitting, easy to operate, save your time and money. Please check your machine before purchase, don't fit garden hose. Requirement: Require pressure washer have 100BAR - Over 1450 PSI Pressure and 2.0Gpm flow for use. Maximum pressure: 200BAR - 3000PSI; Maximum flow:5.3Gpm. Highest Water Temperature: 60℃/140℉. 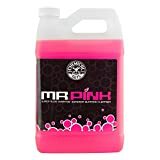 Multiple use: Car, Motorcycle Washing, floors,Windows washing, Driveways, Roofs, Siding washing and so on. Ideal for enthusiast or professional use. 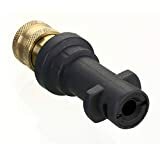 It can be directly connected on the pressure washer gun. 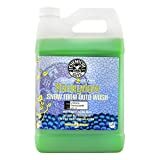 6.Great for Driveways, Vans, Roofs, Garden Hose, Siding, Cars, Trucks, SUVs, boats, trucks and windows. 5.Adjust the knob on the top to control how much water is mixed in. (-) sign indicates less water (more foam is produced), and the (+) indicates more water (less foam is produced). Contact the seller by email for any claims, Professional Customer Service respond your question in 24hours.